Any review of Harold Pinter’s plays is so wreathed in legend and history it’s hard to see the wood for the trees. Indeed Sean Mathias’s production makes visible an arbour of trees suggesting the Hampstead Heath to which his main characters, Hirst and Spooner both refer for very different reasons. It’s a little obvious and I wonder how Pinter, known for his oblique and unknowable meanings would have reacted. Be that as it may, No Man’s Land has an illustrious pedigree to live up to. Gielgud and Richardson were Hirst and Spooner’s first inhabitants, later Pinter himself with Paul Eddington and Corin Redgrave memorably with John Wood in Pinter’s own production at the National Theatre fifteen years ago. It’s bleak terrain indeed, this variation on a theme of male aggression woven into a strange music hall double act tiptoeing down a memory lane of nostalgia, absurdity, and ultimately death. 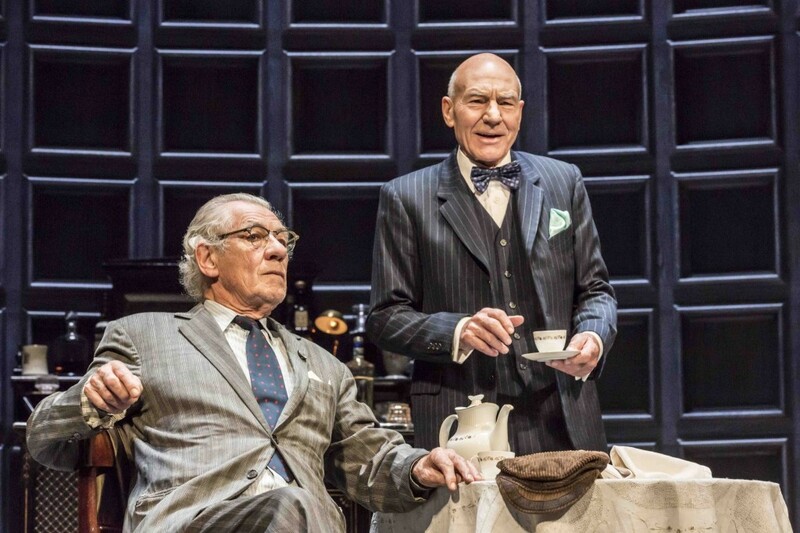 With echoes of T S Eliot and Beckett, the play is full of cadences and verbal arias which Patrick Stewart and Ian McKellen navigate with ease and in McKellen’s case with comic aplomb. Has there ever been a funnier Spooner? 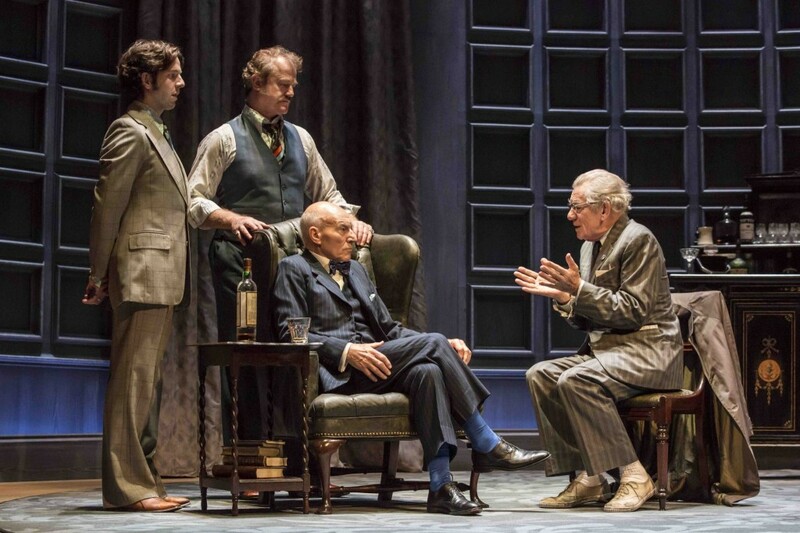 McKellen gives us a star turn, making the most of Pinter’s pauses and juxtapositions with an extra flourish of the hand, wrist or hip swerve for his character’s oleaginous shifts whilst Stewart is at his most gaunt meditating on loneliness and the passage of time from the deep recesses of a button leather chair, shrivelling in size before our eyes. There’s plenty to entertain in Mathias’s revival, the piece de resistance being the second half `pas de deux’ of Hirst recalling Oxford lovers, affairs and clubs – a wicked Pinter satire on Oxbridge elites and clubmen to which McKellen reacts with smiling befuddlement as if running for a retreating bus. Still, something is missing – a tone, a darkness – whilst the peripheral `minder’ figures of Briggs (Owen Teale) and Foster (Damien Moloney) go for nothing. According to the programme, all four characters are named after Pinter’s cricketing heroes – a telling detail but not one that here makes its mark in any significant way. No Man’s Land remains a frustrating experience. 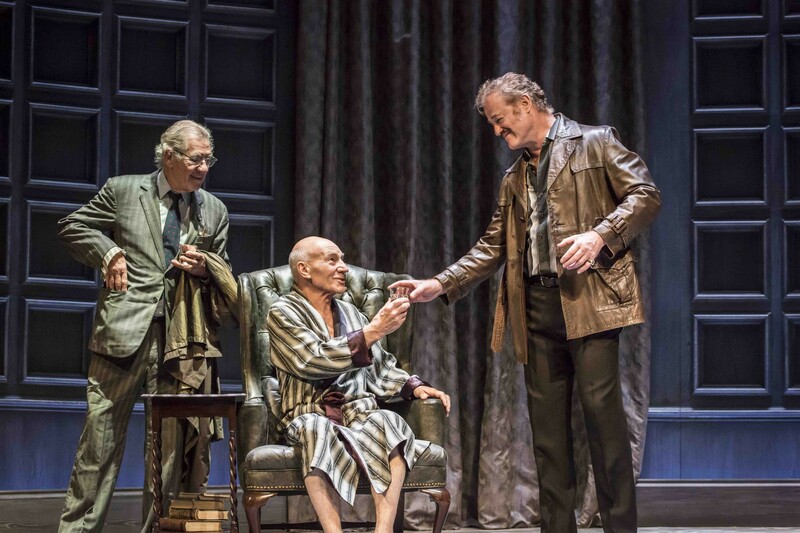 This entry was posted in 2016, Reviews and tagged classic memory play, Damien Moloney, Hampstead flaneurs, Harold Pinter, Ian McKellen, Owen Teale, Patrick Stewart, Sean Mathias, Wyndham's Theatre on September 26, 2016 by Carole Woddis.